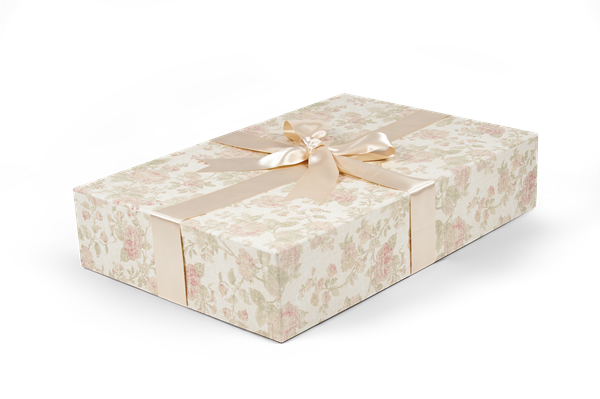 All of our information provided refers to the wedding gown which is the family heirloom that is the most likely to be cleaned and boxed. However, all of our recommendations apply to all other fine garments and textiles such as christening gowns, uniforms, quilts, and costumes. How do I preserve my gown or other textile? Preparing your bridal gown for preservation is easy. First have it cleaned by a professional. The Drycleaning and Laundry Institute advises that the first 3 weeks after the wedding or other event is the most opportune time to remove stains such as champagne, lipstick, hemline dirt, and perspiration. The longer you wait the more likely stains will become difficult or impossible to remove. Stains can remain invisible for months before turning brown and impossible to remove. The sugars from your drinks like soda and alcohol will caramelize and leave ugly brown stains; dirt will weaken and break down fibers in your gown; food stains will attract insects and perspiration can oxidize and cause yellowing. Then, place it in a safe container and a safe place. Whether a garment bag or preservation box, all our products are designed for the safe preservation of bridal gowns and other textiles. To see our FAQ on where to store your gown, please click here. What are other ways of storing gowns for preservation? You will probably pick up your wedding dress from the bridal store in a plastic bag (PVC). These are only meant for to be used for a few weeks. If your wedding is more than a month in the future, DO NOT keep it in this bag. Storage bags made with polyvinyl chloride (PVC) can degrade quickly, releasing fumes that are harmful to textiles. 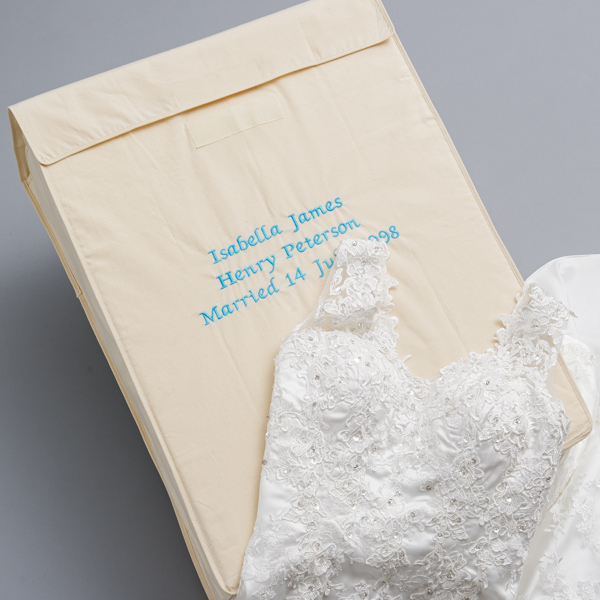 Muslin Garment Storage Bags are a safe way to store your wedding dress. Natural unbleached muslin is stable and non-acidic. It is a great buffer against moisture and contaminants found in your home. This is a material often used by museums. These bags can be personalized. Tyvek® garment bags made with polyethylene are inert; Tyvek® is often used by conservators. It has the added benefit of breathing, which is good for the gown. NWPP Non-Woven Polypropylene is a reusable, recyclable material that breathes and is used to store textiles and other items. It is also used for reusable grocery bags. Our NWPP Zip Paks can also be used within a box for an extra layer of protection, especially in humid areas. If you decide to hang your gown long term, you should take some precautions to avoid stretching of the fabric in the shoulders and bodice. Make sure you use a sturdy and strong padded hanger; a hanger padded with cotton batting. Do not use a hanger with foam padding since it will degrade. In addition, a hanger covered in a natural material such as muslin or linen is best. You can sew cotton bias-tape straps into the waistline to reach to the hanger. This takes some of the weight off the gown’s bodice. Stuff the sleeves and bodice with unbuffered, acid free tissue. What are the ANSI/NISO Z39.48 -1992 Standards? There are several national and international organizations that provide standards for both the testing of products and the results of the tests. ANSI (the American National Standards Institute), NISO (National Information Standards Organization), ISO (the International Organization for Standardization), and ASTM the American Society for Testing and Materials are standard setting organizations. They work closely together. Their standards for Permanence of Paper are all similar to one another. We use these standards interchangeably to test our garment boxes. NISO, published the Z39.48 standard for “Permanence of Paper for Publications and Documents in Libraries and Archives.” And the ISO 9706:1994 Information and documentation — Paper for documents — Requirements for permanence are two that are very common. Both require several tests to be met – including tests for pH levels, alkaline reserves, tear resistance, lignin, and Kappa number. The paperboard that Foster-Stephens uses in all its paperboard and corrugated products meet or exceed the standards set by both ANSI/NISO Z39.48-1992 and ISO 9706:1994. What do acid-free and lignin free mean? For archivists and conservators, acid-free means that a material has a pH level of over 7 but less than 9.5. If the board is too alkaline (over 10), the board could weaken natural protein fibers, such as silk and wool. If the board is acidic (less than 6.5), first the paper will degrade and that could damage the textiles stored within the garment box. Lignin is the fiber in a tree that allows it to stand up. It is the second largest component of the wood part of a tree, with cellulose being the principal component. Lignin will decompose over time, releasing acidic and corrosive elements, making the paper yellow, brittle, and weak. The Kappa number measures lignin. A Kappa number of less than 5 (1% lignin) is the standard. Our paper tests to less than 5. What do heirlooming and preservation actually mean? Heirlooming and preservation are dry cleaning industry terms for the cleaning and packaging of wedding gowns and other precious textiles for long term storage. Cleaning properly, removing dirt and stains and placing the gown in an acid free box with acid free tissue and/or with natural muslin is the proper way to “heirloom” or “preserve” your wedding gown. Gowns may also be preserved in archival Tyvek® or muslin garment bags, but for long-term storage, lying flat is the best choice. What harms textiles causing them to yellow and deteriorate? Where should I store my gown after I have it cleaned properly? We recommend an inside closet or under a bed. Ideally, it should be in a dark, cool (60° to 65°F) clean place with a low relative humidity level of under 50%. It is very important to have constant temperature and humidity levels. DO NOT STORE your gown in a basement or attic. Temperature and humidity fluctuations can damage the fabric; dampness can encourage mold and mildew. Protect it from molds, dust, fumes, and other contaminants, while still allowing air to circulate. Protect it from insects, and mishandling with a sturdy barrier. Make certain that your gown is completely clean before storing. Remember, what is comfortable for you is also comfortable for your clothing. Store in a dark place, light can damage your gown. Light can fade and weaken fabric. If you live in a high humidity area, ask the cleaner what extra protection they can offer you against humidity damage. We have products that will combat this problem and they are recommended highly to prevent mold and mildew. Use an inner NWPP Zip Pak or a Muslin Wrap and Cover to protect your gown. Why should I clean and preserve my wedding gown or other family heirloom? The wedding gown is a representation of one of the most wonderful days of your life. It is often a costly part of your wedding day and a very personal statement about yourself. You have dreamed about this day since you were a little girl and the gown you choose represents who you are on this wonderful day. You may also choose to pass it on to a sister, friend, daughter, or granddaughter someday. Other family heirlooms carry the same emotions as a wedding dress. Christening gowns have been used for generations. Military uniforms remind us of our or a family member’s service to our country. Graduation robes, sports uniforms, costumes, quilts and handmade items can all have special significance for you or your family. Will preservation keep my dress safe forever? There is no guarantee that a cleaning and boxing or placing in a garment bag will prevent deterioration to your gown. A proper cleaning, archival, acid free packaging, and precautions on where you store it can help limit deterioration and maintain a long future for your gown. Do not store your gown in a place with fluctuating humidity or temperatures, such as garages, basements, and attics. Fabrics like the same conditions as we do, an inside closet or under a bed are ideal spots to keep them safe. We are very proud of our commitment to the environment and our planet. We are certified by CarbonFund.org, and recycle as much as possible and use earth-friendly practices in our office and warehouse. As such, most of our products are recyclable. The materials in the windows, NWPP and Tyvek® bags are all recyclable. Our muslin products can be recycled wherever fabrics are recycled, and of course, our board is also all recyclable. How Do I Fold a Bust Form? How do your boxes help protect and prolong the life of my textile? Foster-Stephens’ archival keepsake boxes are strong and sturdy, keep out light, stabilize humidity levels, keep out dust, pollutants, mold, mildew and allow for air circulation. You will not find brown or white kraft paper (grocery bag paper) lining the insides of our boxes, unlike many storage boxes. Beware of boxes that are made of kraft paper or pH neutral paperboard. Brown kraft board is acidic and will break down and cause severe damage to your textiles. pH neutral boxes maybe buffered which can damage protein-based cloth like silk and wool. We make our boxes to ANSI/NISO Z39.48 standards. They have been safely storing garments around the world since 1947. We can embroider or monogram all our muslin products, with three lines of embroidery. The lines can have 24 characters each. Available colors are: White, Black, Metallic Gold, Metallic Silver, Antique Gold, Antique Silver, Royal Blue, Navy Blue, Light Blue, Turquoise, Light Pink, Dark Pink, Hot Pink, Orchid, Burgundy, Dark Red, Red, Emerald Green, Peacock, Chartreuse, Yellow, Orange, Brown, Teal, Dark Olive, Light Olive, Purple, Lilac, Coral, Apricot, and Neutral (tone on tone). Fonts available are: Script, Calligraphy, Old English, and Block. If you wish to have a color that is not listed, multiple colors, a logo or other art-work, multiple items with the same embroidery or silk-screening, please email us at: info@foster-stephens.com. You may also note it in the comments box on the order form, and we will contact you. Personalization will take 10 business days (usually less) before shipping. Check out our YouTube Video on How to Place Your Embroidery Order. How does the Box Exchange Program work? I don’t live in the United States; can I still buy from you? We ship internationally; your shipping rate will be given in the cart when you choose the manner of shipping. If you should have any questions about shipping to your country, please email info@foster-stephens.com. Let us know the quantity of what you want as well as your country and postal code if applicable along with your question. What is the difference between Monograms and Initials? Foster-Stephens offers embroidered personalization on its muslin products. 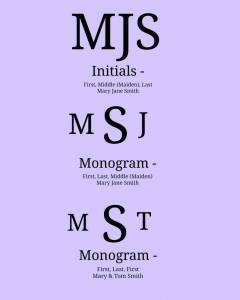 There can sometimes be confusion on what the correct format for Monograms and Initials is. While some people toss tradition aside and do what pleases them, others prefer the most traditional forms (which can very by location). The example below shows some of the most popular forms. Initials are normally in the same order as your name, and with all letters the same size. While monograms normally have the last or family name initial in the middle, or even just the family name initial. For a single person, a monogram is typically, First, Last, Middle. For a married woman, she has the option of using her middle name, or her maiden name for the last letter. A married couple would have First, Last, First. Some areas put the woman’s first initial first, while others prefer the man’s. For Initials, please use the embroidery lines. The Monogram has 2 lines, so a date, last name, or other information can be embroidered with the monogram. What if I buy the wrong size box? No need to fear! With our Box Exchange Program, available for all Museum Style Preservation Kits, you just call us up or email us, and we will pick-up the wrong sized box and send you the right size box. Call 1-800-279-8269 x 203 or email us at customerservice@foster-stephens.com. To avoid this problem, check out our “How to Measure Your Gown” video on YouTube. Natural unbleached muslin is stable and non-acidic. It is the same material used by museums worldwide such as the Smithsonian. We have taken the perfect material and sewn it into garment storage bags for easy use. This material is a great buffer against moisture and contaminants found in buildings. We pre-wash our muslin wrap to remove starches so that you can immediately wrap your gown, textiles, or precious heirlooms in it for safekeeping. Non-Woven PP is short for non-woven Polypropylene. It is a lightweight but very strong man-made fabric that will resist punctures and tears from sharp edges. It is also water resistant and soft. These features make it convenient for transporting textiles. It is reusable, recyclable and occasionally made with recycled products. It also uses less energy to create non-woven polypropylene bags than it does to create woven materials. Non-woven fabric is a fabric-like material made from long fibers, bonded together by chemical, mechanical, heat or solvent treatment. The term is used in the textile manufacturing industry to denote fabrics which are neither woven nor knitted. These fabrics are perfect for seasonal garment bags and traveling bags since they are tough, yet soft and flexible. They also make great sweater storage bags and liners for several of our Museum Style Boxes. Click here to see all our non-woven bags. Which box size is right for my gown or other textile? If your cleaner cannot offer you an archival, acid free wedding storage box, you can buy one from us and pack the gown yourself. The size of the box is important. If you choose a box that is too small, the gown is cramped which could cause permanent wrinkles. It should fit comfortably in the box. We have many sizes of boxes from which to choose. If you have a full skirt or a long train, you will definitely need a deeper box. You may need to store your wedding accessories in a smaller box. An easy way to help determine the correct size is to layout the garment front down and make two folds. Fold in the bottom/train over the midsection and then fold the bodice on top. Take a measuring tape and get the approximate length and height and add about an inch. Use those dimensions as your desired box size. We always offer free exchange, on our Museum Style Preservation Kits, if you are not happy with your chosen size. Check out our YouTube Video that shows you how to determine the right box size. Can I choose what product my cleaner packs my gown in? If your chosen dry cleaner cleans in-house, ask what kind of box or bag the cleaner provides. Does he give you a choice? If not, can you get it returned in a normal dry cleaning bag and pack it yourself? Many cleaners use cheap boxes to keep their costs down and these boxes are often acidic and will break down and cause irreparable damage to your gown. If they are using a Foster-Stephens’ archival, acid free box you will be properly protecting your gown. Should I be concerned if my drycleaner sends the gown out to be cleaned & preserved? That depends; your bridal gown could end up in a gown mill where your gown will not get the one on one attention that it deserves. There have been past reports of these gowns not being cleaned, missing veils, and even the wrong gown in the box. These plants often seal your bridal gown in plastic and advise you not to open the plastic. The plastic they seal your gown in will prevent proper airflow, which is crucial for long-term preservation. Museums do not store their precious textile in plastic! The plastic can cause mold and mildew to grow inside and is especially bad in high humidity areas. Also, these facilities try to keep wholesale cost down by using cheap, acidic boxes. Should I inspect my gown periodically? Conservators recommend repacking your gown every 2 years. Changing the folds around will alleviate permanent creasing and you can check and make sure that no stains have developed and that there is no deterioration. You will need new acid free tissue and be sure to wear the cotton gloves we provide in our wedding dress boxes when handling your textiles. Keep children and pets away from the gown and your work area. Avoid transferring dirt and oils from your hands to your gown by wearing cotton gloves. Rings and bracelets can snag your gown so remove them. Lay the gown down on a flat, clean surface when inspecting and repacking it. What should I know about care labels? Care labels only need to show one acceptable method of cleaning. Sometimes another method may work just as well. A reputable cleaner will know what method to use on your gown based on the materials, trim and any beads or sequins. One thing to note: the entire gown should be cleanable by the same method. If it says “exclusive of trim” and the gown is covered in beads and sequins, it may NOT be able to be successfully cleaned. Click here for the US Government site on care labels for wedding gowns. Where do I go if I cannot find a drycleaner in my area? If you cannot find a professional in your area to clean and preserve your gown, check our resources page for dry cleaning associations that can give recommendations. We highly recommend Wedding Gown Specialists. They not only provide personal one on one care for your gown but they also only use archival acid free boxes made by Foster-Stephens, Inc. In 1987, they went through dozens of packed gowns that had been in storage for 40 years and found the ones in Foster-Stephens’ boxes to be the best preserved.